If you are a mom, this is book is for you. I will tell you that initially I was drawn to it because I could feel what the lady on the cover was feeling. She looks like I feel everyday around 3’o clock. 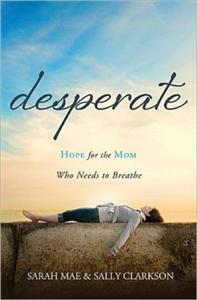 There is so much in this book that every mom needs to hear. For example, formulas don’t always work. I know that I am a schedule, formula, A + B = C Mommy. But my son Weston has done his best to teach me about “out of the box” kids. If he wasn’t convincing enough, God gave us a foster daughter whose mission in life is to be sure I know she definitely does not fit in any box…EVER. I have just started reading this book, but my take away so far is that “A Mom is exactly the person that her children need; God created it to be that way.” Co- Author Sally Clarkson did a beautiful job of reminding me that we should stop believing there is “one right way.” She said, and i know this to be true, that Moms fear what others think of them, their parenting, and their choices for their families. A challenge for today, to be yourself! Sally says, “…it takes faith to be yourself, to embrace your own ideals and family design.” Proverbs 29:25 “The fear of man brings a snare, but he who trusts in the Lord will be exalted” I am so looking forward to finishing this book!